Transformers: More Than Meets The Eye #19 is an amazing continuation of the series. It brings so much more to the storyline. 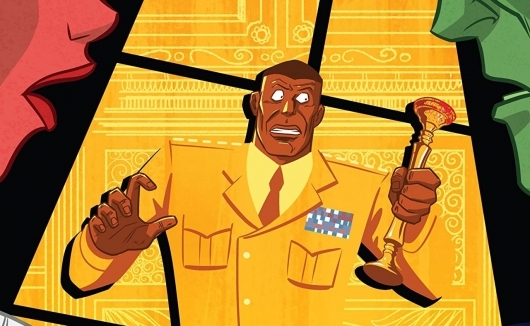 In this issue, we are treated to Minimus Ambus trying to explain who he is and was. It takes the reader, with Rodimus playing proxy, through how Ambus was Ultra-Magnus, what is the Ultra-Magnus, and how he got there with him in the cell. This story by James Roberts is truly amazing, and I would definitely recommend it. That said, you will need to have read the previous issues, because the plot is a bit complicated. At points, it can be difficult to figure out what’s going on if you hadn’t read at least a few issues earlier. Not too long ago, IDW split their Transformers line into two books, Transformers: Robots in Disguise, and Transformers: More Than Meets the Eye. 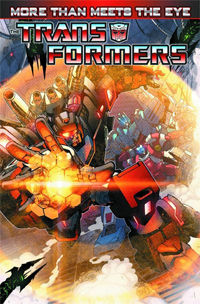 Each book focuses on a different set of Transformers as they set out on different missions to restore Cybertron in the wake of the end of the great war that has defined the bulk of every Transformers story since the very beginning. Transformers: More Than Meets the Eye Vol. 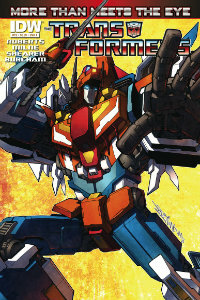 1 collects the Death of Optimus Prime special and the first three issues of the MTMTE series. These issues set up the new status quo for the series, and see a crew of mostly lesser known ‘bots as they go on a quest to the stars. 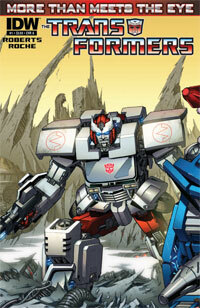 IDW is taking the Transformers universe in a bold new direction. 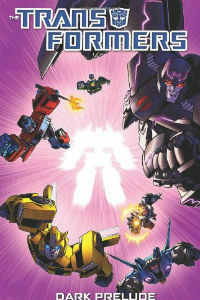 After the events of the previous series, The Autobots no longer wage battles to destroy the evil forces of the Decepticons, as the cartoon theme song once said. The war between the Autobots and the Decepticons is finally over. The Matrix was used to purge Cybertron, and the planet has reverted to a primordial state. 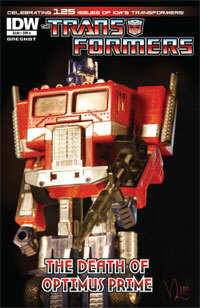 Also, Optimus Prime has apparently retired, leaving Cybertron to explore the galaxy. In the remnants of the Matrix, the Autobots discover a star map that appears to lead to Cyberutopia, the home of the legendary Knights of Cybertron. Rodimus is now convinced that the Knights are real and he is assembling a crew to travel in space in search of the Knights.